With West Nile virus in the news I’m sure I’m not the only one thinking about mosquito control. Even though where I personally live we’ve had a significant drought and the lowest bug summer I can remember, there has still be one West Nile case in my county and with little kids I do worry, I’m sure other parents are in the same boat. Parent is latin for worrier. There are two ways you can go about this problem, stop them from breeding and living in your yard, or killing them once they inhabit your yard. 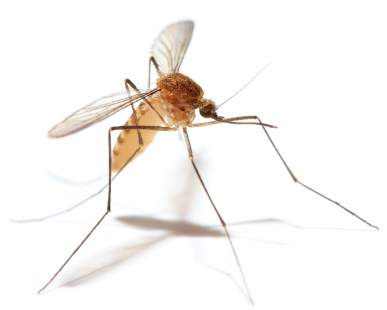 Most, but not all, mosquitoes need stagnant water to breed, and most mosquitoes stay around where they were born, so the easiest way to keep them out of your yard is to make it an unattractive for them to breed there. The easiest way to do this is after it rains, or after you use sprinklers and hoses, and thoroughly go around your property and empty any container containing water, but you do have to be thorough. Mosquitoes like water that sits for 4 or 5 days, but they can breed in as little as a tablespoon of water, as little as a bottle cap full, so you must be very thorough. Places often forgotten about are the insides of old tires, all the various nooks and crevices in children’s toys, and gutters. If your gutters are not clean and water sits in them over time, that is prime mosquito territory. So clean your gutters, or use gutter guards. What about places you keep water on purpose? Keep your pool and hot tub chlorinated and they will be fine. Your bird bath needs to have water changed regularly, you can also place agitators in your bird bath to keep the mosquitoes at bay. Your ponds or water features need to be well stocked with fish, and the fish will deal with the mosquitoes. If they aren’t, you need to add something that will kill them, such as mosquito dunks which are this bacteria that kills mosquito larvae in water, but doesn’t harm anything else, a good product. If you have a rain barrel make sure it is fitted with a secure mesh opening that prevents any bug entrance, and you can also use the mosquito dunks in it as well. So remove the water you do not want, and maintain the water you do want, and you should be okay. But what if you get mosquitoes anyways? Lets talk about bats, man. Bats eat mosquitoes. Of course, we humans dislike bats for a variety of reasons, fears of disease which are often unfounded, dracula mythology, being creeped out by nocturnal flying mammals, whatever. I’m not asking that you invite bats into your home, by all means, make sure your attic is secure, but providing them habitat in the form of a bat house somewhere on your property might not be a bad idea. Sure, there is no guarantee they will eat in your yard and not your neighbors, will eat mosquitoes instead of other bugs, but more bats should, in the grand scheme, equal less mosquitoes. Also, you can collect the droppings from underneath to fertilize your garden. If bats aren’t your thing, how about birds? Attract birds that eat mosquitoes to your yard. The most well known bird that does this is the purple martin, but the popular marketing associated with the purple martin houses you see for sale appears to be incorrect. Martins do eat mosquitoes, but not an overly large amount of them. There are however other birds such as swallows and chickadees that will eat flying insects as well. So make your yard bird friendly. Topically this reminds me well of snakes. Many people hate snakes and shudder to think of snakes being in their garden, but snakes will not eat your plants, dig holes, pull up bulbs, eat roots, destructively tunnel, etc. Rodents do all those things, and snakes eat rodents. So, like bats, snakes are a creature with a bad reputation that actually help your garden. Moving on, there is a mechanical control you can use. The famous mosquito magnet does indeed work. Mosquitoes are attracted to CO2 and the devices uses propane and an attractant to generate CO2 and then pull the mosquitoes into a trap. It works, it can be effective for small areas, but it is expensive, both to buy and to keep running. Light attracting bug traps or zappers do not work for mosquitoes, mosquitoes are not attracted to light. Those things will kill lots of other bugs (few of which are harmful to humans) but they are not effective against mosquitoes. Finally, you can go the insecticide route. The best product for that is a fogger. Foggers come in many different types and they spray a cloud of insecticide, easily filling up an area. I’ve seen someone fog (with a cordless one) an area half the size of a football field in about 5 minutes. The fog disperses, leaving dead insects everywhere. These will kill indiscriminately, any bug flying around, not just mosquitoes. I’m all for saving wild life and using organic products, but I’m also all for not having a loved one die from West Nile virus. When you absolutely have to kill every mother biting mosquito in the room, accept no substitutes. Foggers kill so well that you can actually use your outdoor space after using one, for days even, it will have killed so many bugs you’ll only have to use it again when new bugs move in. I’ve been lucky (cursed?) with the lack of rain this year, and we don’t have many mosquitoes now, but if you live in one of the areas where there is an outbreak maybe one of the above options will help you. Excellent suggestions. Since we’re in the middle of a drought, mosquitoes haven’t been much of a problem, and I’ve become lax about possible rain catchers where standing water could encourage them to reproduce. I’ll put it on my maintenance list to tidy up around the house. Put unused pots upside down, etc. Thanks! Have you ever thought of planting lemon grass and some geraniums? We live in a cold climate, so we do not get mosquitos that often. But when they start coming around we have been blessed with them staying away from where we have these plants. We also encourage bats as our neighbors by planting for a safe environment for them. I really enjoy this forum and your blog! Thanks! We have had so many mosquitoes this year that sometimes we don’t even want to be out in the garden. It is worse around dusk. We always turn pots upside down so there is no water around but there seems to always be big puddles in our alley. That is a great idea about the bat house! I have seen a few bats flying at dusk so maybe we could encourage more. Due to the West Nile outbreaks here in North Texas, we went through a couple of rounds of aerial mosquito spraying this Summer. I had our organic backyard herb and vegetable garden covered in tarps for a couple of days to keep the insecticide out. Haven’t had any real issues with mosquitoes. Think it is because of all the critters, such as geckos, toads and barn swallows we have hanging around. I’ve got a decorative grape vine on a pagoda near my pool. They hold lots of water after it rains. Had to take it out as the mosquitoes were breeding like crazy in there. Great article BTW. I’ve been having my yard sprayed with a product called Talstar P. It’s suppose to be “organic” and not harmful to pets or people. It has no order whatsoever, which is quite nice. It’s sprayed through a pack pack atomizer sprayer. From what I’ve been told, it creates a 3 week barrier around your yard and confuses mosquitos to the point they do not want to enter. I can honestly say it works great! We have absolutely no mosquitos when we spray every 3 weeks. I can go into my neighbors yard who does not get sprayed and be bitten within minutes. There are all kinds of companies providing this service. My Neighbor recently bought the atomizer sprayer and we are going to do it ourselves…wearing a mask just incase! The cost is fairly minimal. The product runs about $50 for a full season or 2. Mosquitoes also tend to breed in wet gutters that are not cleaned on on a regular basis. Regular gutter cleaning helps to prevent the build up of mosquito lava. Water tanks that are not maintained are another cause of mosquitoes. In South Australia we have heaps of mosquitoes because people do not look after their water tanks and their guttering systems.